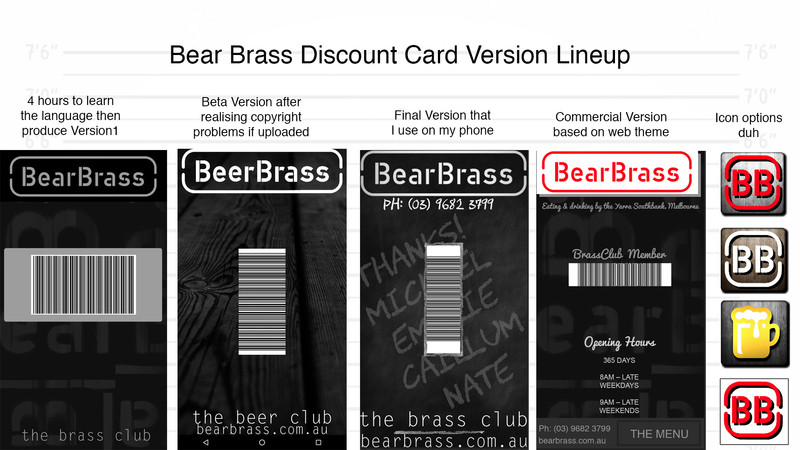 Read on to download the BeerBrass beta app. Specifically I use it for my BearBrass card and in combination with Android Pay I can use my phone to both get my discounted drinks AND pay for them. No getting my wallet out. The only people that volunteered to beta test for me was Sammi (thanks heaps Sammi!) and my housemate. So I’m uploading it here in case if anyone else asks about it later. I can just link them to this. Because you’re not downloading it from the Google Play Store yet, your phone will likely warn you about unknown sources etc. It’s up to you if you trust me or not. I am intending to upload it to the Play store next week, so I can’t be dodgy. After install, enter your bar card number at the prompt and hit ok.
It’s only Beta, so if it doesn’t render correctly and looks weird on your phone, let me know. Make for multiple venues and have it switch card according to GPS location. Previous post A More Modular Roomba Platform – No cutting, soldering, or drilling.